Theresa Schwegel was born and raised in Chicago, Illinois. She is the author of four crime novels set in and around the Chicago area. Her debut, Officer Down, was published in 2005, and subsequently won the Edgar® Award for Best First Novel. In 2008, she received the 21st Century Award from the Chicago Public Library Foundation in recognition for an emerging artist with ties to Chicago. Her fifth novel, The Good Boy, is a family epic that combines the hard-boiled grit of her acclaimed police thrillers with the intimate portrait of a young boy trying to follow his heart in an often heartless city. The book will be released November 5th this year. 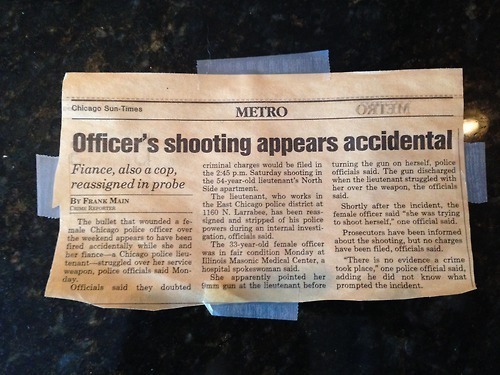 During a thorough pre-holiday cleaning, I came across the article that inspired OFFICER DOWN’s ending. Because this story can’t be entirely true. We’d love your help. Let us know what’s wrong with this preview of Galveston by Nic Pizzolatto. We’d love your help. Let us know what’s wrong with this preview of Then We Came to the End by Joshua Ferris. We’d love your help. Let us know what’s wrong with this preview of Levels of Life by Julian Barnes.
" Shawn wrote: "Thanks for the friendship. I see you'll be at Read Between the Lynes Bookstore in Woodstock on November 5th at 7pm." Great! I look forwar Shawn wrote: "Thanks for the friendship. I see you'll be at Read Between the Lynes Bookstore in Woodstock on November 5th at 7pm." Great! I look forward to meeting you! ...more "
We’d love your help. Let us know what’s wrong with this preview of Cities of the Plain by Cormac McCarthy. Shawn wrote: "Thanks for the friendship. I see you'll be at Read Between the Lynes Bookstore in Woodstock on November 5th at 7pm." Thanks for the friendship. I see you'll be at Read Between the Lynes Bookstore in Woodstock on November 5th at 7pm.